The BioTek ELx50 is a self-contained automated strip washer with a patented 16 channel dual action manifold. This easy to use system allows for precise fluidic delivery, from the full force of a pressure delivery system, to a gentle drip. The Dual Action Manifold on the Biotek ELx50 Microplate Strip Washer delivers unmatched performance with two sets of aspiration and dispensing tubes per microplate well, guaranteeing low aspiration residuals. As a truly flexible platform, the Biotek ELx50 Microplate Strip Washer has independent control of aspiration and dispensing manifolds used for overfill along with overflow protection of both 96 well and 384 well microplates. System works well with solid bottom microplate plates traditionally used for cell based and ELISA assays. The Biotek ELx50 Microplate Strip Washer has robust onboard software for quick and easy programming offering your lab a complete wash solution with consistent performance and unattended operation in a compact footprint. 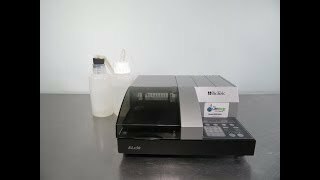 The Biotek ELX50 Microplate Washer has been tested and performs as expected. All of our lab equipment comes backed with our standard warranty. If you have any questions about this reagent dispenser, please don't hesitate to contact us.